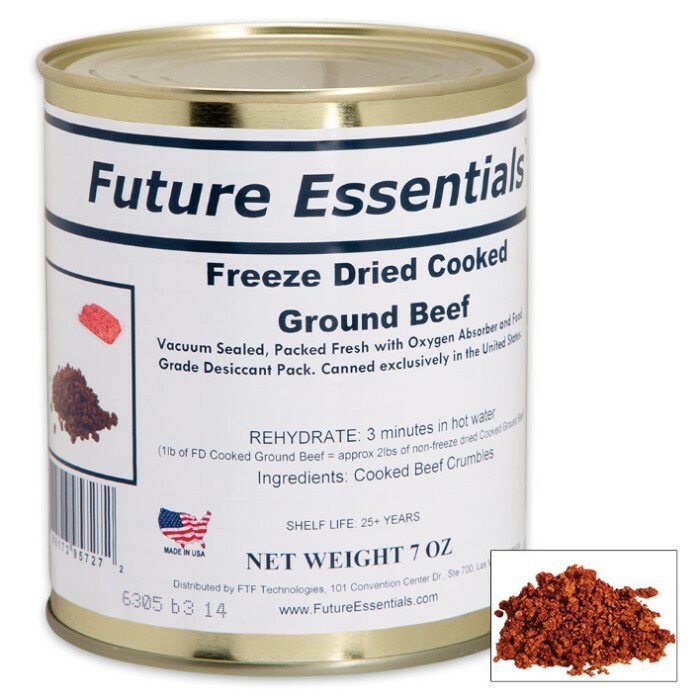 Future Essentials 7-oz Freeze-Dried Ground Beef in Vacuum-Sealed Can | BUDK.com - Knives & Swords At The Lowest Prices! Whether you’re preparing for the zombie apocalypse or just the next major storm, American-canned Future Essentials Freeze-Dried Ground Beef is a delicious and affordable must-have for your emergency prep pantry. More than mere survival fare, it’s also a quick, convenient and tasty meal option for moms, college students and other busy individuals who don’t have time to thaw, brown and prepare fresh ground beef. Each 7-oz can contains six half-cup servings of fully cooked, freeze-dried 100-percent natural US ground beef - no preservatives, no additives. Simply add water and stir into any dish calling for meat - chili, sloppy joes, lasagna, spaghetti, even scrambled eggs, to name just a few; no browning or other prep required! Thanks to its advanced, all-natural freeze-drying process, Future Essentials beef retains the same fresh-food taste and all the nutrition found in ground beef right out of the market cooler. Freeze-drying removes only the water - not the natural flavor, vitamins, minerals and other nutrients. Upon rehydration, within minutes the original size, shape, texture and taste returns. With no water, Future Essentials Freeze-Dried Ground Beef is incredibly lightweight and compact. It won’t occupy excessive space - a precious commodity in emergency shelters -, and it’s easy to carry several days’ worth of delicious freeze-dried food in just a standard backpack. It’s vacuum-sealed and packed with oxygen absorbers and food-grade desiccant pouches, ensuring your ground beef will remain healthy, safe and delicious for 25+ years when properly stored. Whether for emergency prep, outdoor rec or convenient day-to-day meals, Future Essentials Freeze-Dried Ground Beef will make you wish your power would stay off forever! And with our unbeatable low prices, there’s no reason to wait to stock up. After all, you never know when the next crisis or disaster will strike, but with Future Essentials in your pantry you can rest easy knowing your belly won’t be empty. Indeed, “roughing it” never tasted so good!